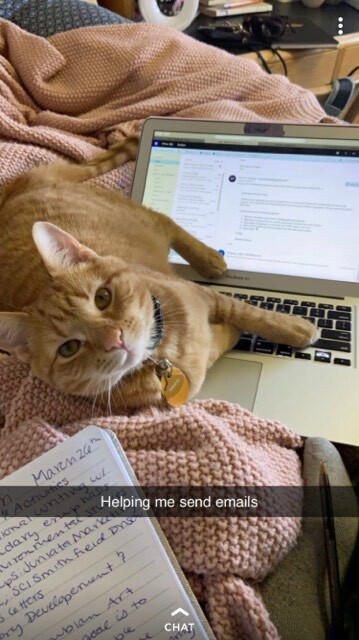 By Amanda Young in Res Life, Student Life, Uncategorized on April 13, 2019 . I guess you could say Dante’s a MacBook cat! A lot of other students at Juniata also have ESA’s. On my hall there are two cats, and some students have dogs living in their dorm rooms. The best thing about bringing Dante as my ESA was how easy the process was. Juniata encourages students who benefit from ESA’s to apply for them and Patty Klug, the Director of Student Accessibility Services, can help you through the whole process. Dante is reasonably limited on campus – he can’t go anywhere a normal pet wouldn’t be allowed to go, other than the residence halls. However, Counseling Services welcomes ESA’s! I’m not the only person who benefits from Dante’s presence. My roommate loves him and girls on my hall always stop by to say hello. Dante’s favorite person is my good friend Julia Newman. Julia is terribly allergic to cats, but Dante’s loving presence is more important to her than her ability to breathe well apparently. That goes to show how good of a cat and ESA he is! Even Pam, who is our amazing custodian in Sherwood Hall, knows Dante by name. He is more popular than any student on campus. If Dante is getting antsy, we put him in a harness and a leash attached to my bed so that he can sit in the hallway. He looks ridiculous – his harness is mean for a small Chihuahua and is neon green, but it’s worth it for him. People walking by will stop to pet him and take pictures with him. This is his favorite part of the day because Dante loves attention more than anything else. He also has quite the following on Instagram! If you walk by Sherwood Hall, you’re sure to see Dante staring out of my window. He spends most of his time watching people walk around campus and smelling the food coming from Baker. If he’s not by the window, he is sticking his paws under the door to bother people walking by. I am so grateful for Dante and for Juniata for allowing me to bring him here. ESA’s are starting to become more common on campus. If you think an ESA may benefit you, it would be a great thing to look into! Hopefully with the addition of pet friendly housing next year there will be even more animals on campus. Even if you don’t need an ESA, we could all benefit from some cat cuddles every once in a while.